Over the course of two hours, we hosted a performance of new writing that emerged from collaboration with Our Mel (a Sheffield-based social enterprise dedicated to exploring cultural identity) and novelist Désirée Reynolds. 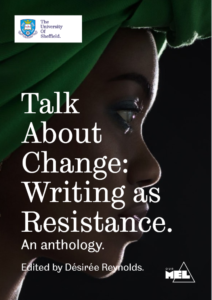 Each of the pieces performed have also been published as part of a limited edition anthology: “Talk About Change: Writing as Resistance”. Together with all who attended the workshops, we compared the role of diversity in historic texts to its position in modern culture: what once characterised a multiplicity of opinion is now used paradoxically of something individual. We considered aspects of feminist debate before the word feminism existed, exploring how the power of virtue changed as men (mostly) discussed the role of women in sixteenth-century England. Using texts about strangers, we examined parallels between the way people wrote (and complained) about early modern outsiders and modern discourse about immigrants. We reflected on the roots of race, its links to kinship, descent, and community and the relationship between structures of language and structures of power. In each session, novelist and creative-writing facilitator Désirée Reynolds recommended other writings to bring out different dimensions of the themes. Wide reading was encouraged, and what you will find in the pages that follow reflects the careful crafting of a range of experience and inspiration drawing on at least five centuries of language use. It is Writing as Resistance. It comes from Talking About Change. If you would like a copy of the anthology (free! ), you can register interest (first come, first served) by filling out a short Google form.